Pre-season football continued around the country this weekend. Here’s a round-up of all the scores. 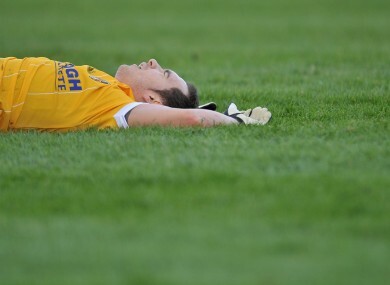 Flat out: Antrim's Brian Neeson during yesterday's McKenna Cup defeat against Tyrone. Dublin 4-14 UCD 0-12 Kevin McManamon, Bryan Cullen, Diarmuid Connolly and Seán Murray got the goals in Parnell Park on Saturday night as the All-Ireland champions eased through to the O’Byrne Cup semi-finals. Longford 0-12 DCU 2-11 There was little to choose between Longford and DCU in a tight encounter in Ballymahon yesterday. The sides went in level at half-time with eight points apiece, but goals from Jack Brady and Donal Smith ultimately proved decisive. Kildare 0-17 Offaly 0-04 James Kavanagh led the way as Kildare eased past Offaly without too much difficulty. The Ballymore Eustace clubman posted four points from play and another from a free to help set up a semi-final against Dublin next weekend. Meath 0-11 Louth 0-05 Meath will host DCU next weekend after scoring a six-point win over a lacklustre Louth in Navan yesterday, Graham Reilly with five points. Derry 1-16 UUJ 0-14 Paddy Bradley marked his return from injury with a goal on Saturday night. The veteran forward scored the only goal of the game as Derry went on to win by five points. Fermanagh 2-13 QUB 0-10 Peter Canavan made it two wins from two since taking charge of Fermanagh. Seamus Quigley, who posted an impressive 1-08 against Queen’s last week, hit the same tally again yesterday. Monaghan 0-11 Down 4-12 Down had it all their own way in Clones as goals from Kalum King (2), Dan Gordan and Benny Coulter gave them a 13-point win against a disappointing Monaghan side. Antrim 0-12 Tyrone 1-10 Tyrone squeezed out a win over Antrim by the narrowest of margins. Stephen O’Neill was the Red Hand’s leading scorer with 1-03. Armagh 1-18 St Mary’s 0-10 Armagh picked up their first points of the pre-season with an 11-point win against St Mary’s, corner-forward Ryan Rafferty with the goal. Cavan 1-14 Donegal 2-08 Paddy McBrearty’s late goal wasn’t enough to spare Donegal’s blushes in Breffni Park yesterday as Cavan mounted a second-half turnaround to upset the All-Ireland semi-finalists. Cavan trailed by 1-7 to 0-09 at the break, but a Raymond Galligan penalty in the second half helped turn the tide in their favour. Galway 1-15 London 0-08 Michael Finnerty scored the only goal of the game as Galway controlled proceedings against London in Duggan Park. Leitrim 1-08 Roscommon 1-05 Leitrim were surprise winners at Ballinamore yesterday, grinding out a rare win against an under-strength Roscommon side. Full-foward James Glancy finished the day with 1-04, his goal coming through a second-half penalty. Mayo 4-11 GMIT 0-11 Danny Kirby’s fab four was the talking point of Mayo’s win in Ballinrobe yesterday. The full-forward terrorised the students’ defence as he scored all of four of Mayo’s goals. IT Sligo 0-06 Sligo 1-09 Sligo were made to work for their six-point victory over IT Sligo in Quigabar. Seven Sligo wides in the first half gave the students hope of a second-half revival, but the game was made safe by Johnny Davey’s goal in the 48th minute. Cork 2-14 Clare 0-07 Conor Counihan may have been looking through his fingers, but his Cork side had it all their own way as they booked a place in the McGrath Cup semis. Colm O’Neill marked his return from a cruciate ligament injury in style, earning all of the plaudits for a performance in which he scored 2-04. Cork IT 2-15 IT Tralee 2-05 A goal and six points from Donal Óg Hodnett helped Cork IT ease through to the semi-finals with a 10-point win over IT Tralee. The students will play Cork in Pairc Ui Rinn next Sunday. Tipperary 4-16 Waterford IT 0-06 Barry Grogan hit a hat-trick as Tipperary crushed Waterford IT by 22 points. Limerick 0-10 UCC 1-19 Sigerson Cup holders UCC were too hot for an under-strength Limerick to handle in Rathkeale yesterday. The students racked up the points in the second half, outscoring Maurice Horan’s men by 0-14 to 0-05. Email “Back in business: here's everything you need to know about the weekend's GAA action”. Feedback on “Back in business: here's everything you need to know about the weekend's GAA action”.